I've been a huge fan of Slack for a while now, the team-collaboration tool that is becoming more of an automated work management system than simply an instant message platform. I use Slack to keep in touch with multiple teams; the marketing team at work, as well as my motorcycle club, including many individuals operating across multiple offices and timezones. However, the true utility of Slack extends far beyond personal communication, as apps like IFTTT, Zapier and Statsbot actually integrate external software and even devices from Slack Channels and Bots, allowing you to control, report and even automate your personal and professional life directly from Slack. Slack commands are incredibly useful, and have replaced many of the myriad calendar, to do list or even project management platforms I've perfunctorily used in the past. Using the /remind command in Slack allows a bot to schedule a personal reminder at a specific time, on a particular day or in a few hours from now. Setting reminders for other team members, or even an entire channel is even more useful. Simply type (in any channel) "/remind [someone or #channel] [what] [when]" and @slackbot will not only remind you of [what] at that particular time, but keep a log of tasks due and completed in your Direct Message history. 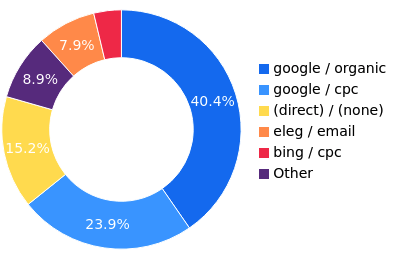 There are numerous other incredibly useful "slash" commands to /invite users, take a /poll, or even set up a /call with the #channel, nearly completely supplanting the utility of Skype. Slack also integrates with multiple other platforms and devices, allowing you to query and control other platforms directly from Slack. I can access my Google Drive, or create a Google Hangout directly from within Slack, or integrate with other project management tools like Jira, Asana or Trello. Using IFTTT, I've set up social media posts or mentions to post to a #social channel so I can monitor activity across different sites. I've set up a Craigslist scrape to post any new motorcycle listed for sale in New York State mentioning the word "Ducati" in the title to a Slack channel in real time. I've configured my Amazon Echo to automatically post reminder to Slack, anytime I add an item to my Alexa To Do list. These personal and professional automations save time, but the most impressive app I've seen yet is called Statsbot, which allows you to run Google Analytics and Salesforce reporting directly from within Slack. As much as I absolutely love running reports in Salesforce (then exporting and waiting to download a CSV, then finally manipulating the data) @statsbot has native querying language and native graphing tools built into the app. For the past month, I've set up automatic weekly and monthly traffic and conversion reporting, so I get a direct message in a private channel as soon as I get a cup of coffee on Monday morning, or right before a marketing meeting. Similarly, I've set up alerts for traffic or goal thresholds, that automatically notify me if visits and conversions don't reach or surpass specific targets, so I can make adjustments to the website or any campaign in real-time. I have similar email alerts set up through GA, or Uptime Robot, but I'm much more likely to notice a Slack notification over a form email. Finally, last week Statsbot announced an integration with the Salesforce API, integrated with Slack, that functions similar to the Statsbot Google Analytics integration. I can query individual leads or accounts with the info command. I can query amount won or this week's leads by source, and make marketing adjustments on the fly, rather than wait for an ROI report from a marketing or finance analyst. I can query a list of all open opportunities by stage, or even opportunities scheduled to close this month, which is far easier than getting a quote from my favorite Salesforce consultant to build a dashboard. And, I can get realtime stats on my sales team, how much they're closing, from where and how well they're managing Salesforce. Best of all, I can schedule these reports to run hourly, daily or weekly, and report back to me at a specific time, when I think I might need it. Slack is quickly becoming the most used software tool in my professional life, as it's giving me realtime insight into various different platforms, social channels, applications and data, that I would need to query individually to use. 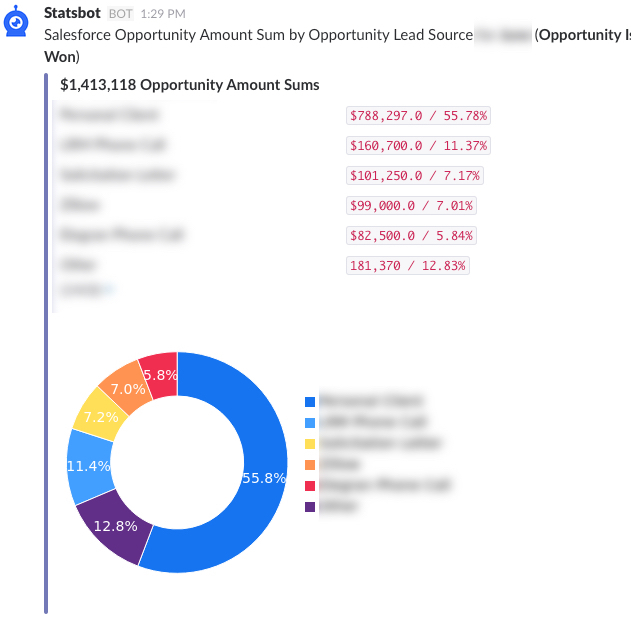 And Statsbot is quickly becoming one of the most powerful app integrations with Slack as commands and scheduling allow me to automate much of the redundant marketing reporting that previously sucked up much of my team and my time in the past.